Editor’s note: Earlier versions of this post ran in 2016 and 2014. We’re publishing this update because editorial calendars continue to be a cornerstone of content marketing planning. For anyone looking to score a quick win with content marketing, I’d like to get one thing straight: Content marketing is not really a turnkey, one-strategy-fits-all technique. For better or worse, successful content marketing works best when it’s a bespoke affair: custom-built to delight your audience and thoughtfully planned to produce tangible business results over the long term. But just because the content process is more artisanal than assembly line doesn’t mean there aren’t a few tried-and-true systems you can use to keep your pipeline flowing at peak performance. 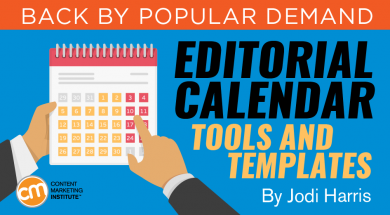 One such tool no content marketing pro should be without is the editorial calendar. Calendars can take many forms – from a simple spreadsheet that guides your team through the production process to a fully interactive map of your content life cycle. But no matter how you construct it, keeping an accurate account of your editorial assets and activities will make you a more effective marketer – and a less stressed one, too. Whether you are looking to build a content calendar from scratch or need ways to make your current tracking process more sophisticated and scalable, the following update of one of CMI’s most popular resources will help you meet your goals. Start by gathering the key information from your content marketing strategy, which will be the basis of your editorial plan. Your answers to the following questions will help you determine what you need to track in your calendar, as well as help you stay focused on your marketing goals. Who are you creating content for? Keep your audience top of mind no matter what. Bonus tip: Learn how to set attainable goals with this SMART technique. What skills and resources do you have at your disposal? Whether you have a dedicated in-house team of writers and videographers, a stable of industry pros looking to share their insight, or something in between, the formats, frequency, and overall workflow you track in your calendar will likely depend on who is writing and where their expertise lies. Bonus tip: Need to increase your team resources to handle the workload? Follow these six steps for finding the perfect content marketing pro. How will you stand out? What unmet industry needs can be addressed with the content you create? What gaps exist in your current content creation efforts – or the efforts of your competitors? What industry events can you tie your content to for added exposure potential? Knowing where you can play a lead role in owning the audience’s attention will help you fill your editorial calendar with impactful content that helps you meet your business goals. Bonus tip: Learn to differentiate your business from the competition by finding your unique content niche. There are dedicated tools that offer a wide range of calendaring capabilities, as well as many content collaboration solutions that have integrated tools to help marketing teams manage editorial processes more efficiently. For example, Michele Linn, CMI’s head of content, relies on Trello, a free collaboration-management tool, to help her track our team’s blog categories, article ideas, posts in progress, and published works. Blogger and journalist Jonathan Crossfield says he uses CoSchedule as an editorial calendar, blog, and social media planner because it plugs straight into WordPress and integrates with Evernote – easing his workflow from initial idea to published blog post. 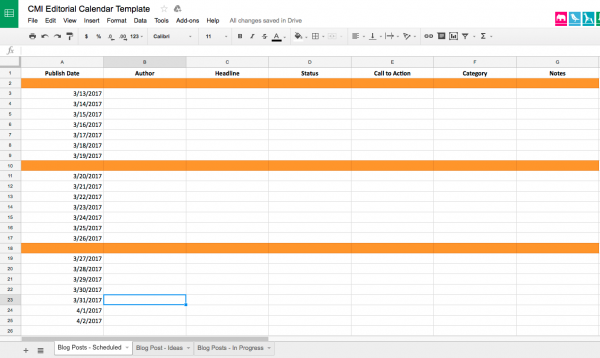 However, if you aren’t looking to implement new tools or technologies, it’s perfectly fine to start out with a simple Excel spreadsheet or a shareable Google Sheet (like the template I share below) to track your content’s progress through your editorial process. Depending on the specifics of your content marketing plan – such as your specific goals, how you define your workflow, and your preferred formats, platforms, and publishing velocity – you may also want to track the following elements to keep your content creation efforts on-strategy over the long term. Your distribution channels: Content marketers can choose to publish and promote their content on a variety of platforms – from blogs and email newsletters to social media channels, paid search, native advertising, and beyond. The more channels you work with, the more critical it becomes to track where each content asset gets shared – and on what timetable – for optimal impact. Bonus tip: Learn to build a channel plan that will put your content in the hands of the right consumers at the right time. Content formats: Is it a blog post? A video? A podcast? An infographic? An original image? To get more mileage from the content you create, you might want to consider repurposing it into other formats at some point. It’s handy to keep tabs on the types of assets you have on hand right from the start. Bonus tip: Each content format has its own strengths and limitations. This content marketing playbook will help you choose the best ones for your business. Visual elements: Speaking of assets, it’s important that you don’t overlook the appeal that visuals can lend to your content, both in terms of social sharing potential and overall brand recognition. Tracking the visual elements you include in your content efforts – such as cover images, logos, illustrations, charts – will make it easier to ensure that your work has a signature look and cohesive brand identity. Topics/categories: This helps make your calendars more searchable and can help you uncover potential opportunities to fill gaps in your coverage. Keywords and other SEO metadata: This includes meta descriptions and SEO titles (if they differ from your headlines). Including this information in your content calendar will help you ensure that your post is well optimized to target the key phrase you are looking to rank for and well aligned with your business’s overall SEO strategy. Bonus tip: Learn to make your SEO metadata more informative, so you can drive more traffic to your content through search. URLs: This info can be archived as an easy way to keep your online content audits updated, as well as to make it easier to build back-links to your highest-converting content assets. Calls to action: This helps you ensure that every piece of content you create is driving your business closer to its marketing goals. The CMI editorial team uses a multi-tabbed spreadsheet that’s based on the editorial calendar template below, so that all the various editorial information we track can be found in one document. Click the image to download your own copy, which you can customize to your team’s specific content needs (go to “File > Download As >” and select the format you would like). One of the most challenging parts of the editorial process is making sure you have enough interesting ideas in your pipeline, so you can turn them into valuable content pieces and maintain a consistent publishing schedule. Bonus tip: Following this eight-step process will make it easier to keep your pipeline filled with high-quality content pieces. As you can see in the sample template above, you may also want to include a tab to collect topics and story ideas for future content creation efforts. Keeping a running list of ideas within your calendar spreadsheet makes it an easy reference tool when you need some topic inspiration or starter ideas for brainstorms. Bonus tip: Speaking of content curation, Heidi Cohen offers eight tips on how to fill your content calendar with compelling curated content. Reporting: Keeping a record of your content as you create it gives you a head start in tracking the performance of each piece after publication – and for sharing the results with your team and upper management on an ongoing basis. You can add columns (or tabs) to your main calendar to keep the relevant analytics data you track ­– like page views, clicks, or conversions – on hand. 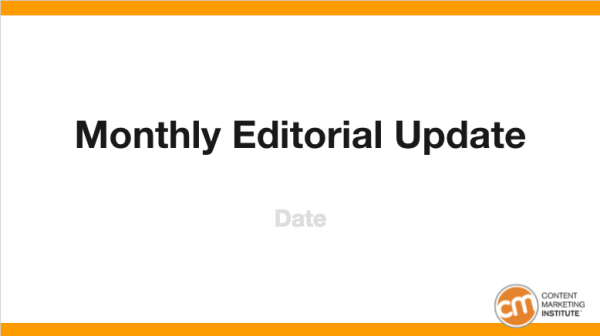 Alternately, you can simply grab the most pertinent post information from your content calendar and plug it into a separate editorial reporting template, like the one our team uses for monthly updates (click on the image below to view the full template, or download your own copy). Aligning content across the enterprise: Sharing your content calendar with your sales, marketing, HR, public relations, or other departments makes it easier for them to understand your content efforts, leverage them to further their own goals, and alert you when they’re involved in new events or opportunities that might spark fresh ideas or impact your project priorities. The possibilities are practically endless when it comes to using editorial calendars to organize your content marketing and keep your efforts moving in the right direction. What additional tips, tools, and ideas have worked well for your calendaring efforts? If you have other suggestions, please share them with your fellow content marketers in the comments. And if you are looking for help with other tasks in the content marketing process, check out our favorite collection of content marketing templates. Make an appointment every day (or every week) to grow your content marketing skills. Subscribe to CMI’s free daily or weekly digest.